It’s that time of the year when love is in the air. The card stores are an explosion of red and pink hearts with little dudes in diapers shooting arrows. Flower bouquets are everywhere. I’m also guessing that dating website subscriptions go up around this time, as single folks look to find love. Well, I’ve been looking for love too. But I ain’t talkin’ ’bout that kind of “love.” Instead, I’m talking about the love of players who could help me win a league championship in the world of fantasy football. Yup, I’m already starting to crush on these fantasy players (20, to be exact) who could produce big-time stats in 2019. I won’t be labeling these players as “sleepers” or “breakout candidates,” they’re just guys who I believe could be great draft bargains, stat-sheet stuffers … or both. So sit back with a loved one and check out who you might be falling in love with ahead of the next fantasy football season. 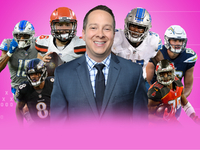 Kenny Golladay, WR, Detroit Lions: Golladay’s stock is on the rise after he recorded 1,063 yards and five touchdowns in his second NFL season. I’d project him to be the No. 1 wideout in the Lions offense heading into training camp even with the return of Marvin Jones (not a bold assertion), and I like him to take the leap into being a potential top-15 PPR wideout in 2019. Golladay should be a top-40 draft pick. Josh Jacobs, RB, Alabama Crimson Tide: Projected to be the first running back picked in the 2019 NFL Draft, Jacobs could turn into a star as a rookie. He averaged 5.3 yards per carry and scored 11 rushing touchdowns while in a timeshare with Damien Harris last season, and Jacobs also tacked on 20 catches for 247 yards and three more scores. If he lands with a team like the Tampa Bay Buccaneers or Baltimore Ravens, look out. Aaron Jones, RB, Green Bay Packers: My love affair with Jones is well documented, as I screamed from the mountain tops that the Packers should feature him for weeks before it happened. When it did, he averaged 17 touches per game (Weeks 8-14) before an injured knee cost him the final few games. New coach Matt LaFleur loves to use the running game as he showed in Tennessee last season, so Jones should shine. Cooper Kupp, WR, Los Angeles Rams: Kupp was far more consistent than his numbers suggest, as he scored 16-plus PPR points in five of the six games he was able to finish. Remember, he left two different games with knee ailments that eventually cost him the season. Couple that with the fact that Jared Goff targets him often in the pass attack, and I could see Kupp being a middle-round steal in 2019 drafts. Kerryon Johnson, RB, Detroit Lions: Johnson started to show signs of breaking out in the final five games of his rookie season, during which time he averaged more than 17 touches and 17 PPR points per game. When you consider coach Matt Patricia’s desire to lean on the run, it would be a surprise to no one if the Auburn product pushes for high RB value in 2019 fantasy drafts. I love him as a top-50 selection. Derrius Guice, RB, Washington Redskins: Guice texted me that he’s making a lot of progress and getting great feedback in his return from an injured knee. He also tweeted out a video of him working out, and he’s putting in work with Adrian Peterson in the offseason. Barring any setbacks in his return to the gridiron, Guice has the skills to post tremendous numbers in a Redskins offense that will lean on the run. Hunter Henry, TE, Los Angeles Chargers: Tight end is one of the thinnest position in the league, but it will get a bit deeper with the return of Henry. The talented pass catcher, who scored eight times as a rookie, is back at 100 percent and was even able to see 14 snaps in the Chargers‘ postseason loss to the New England Patriots. His potential to be a top-5 fantasy tight end this upcoming season and beyond is obvious. O.J. Howard, TE, Tampa Bay Buccaneers: Howard was on this list last season and showed some real signs of breaking out before a bum ankle cost him the final six games. In fact, he had a six-week stretch where he scored four touchdowns and averaged 13.5 PPR points per game. With an offensive-minded head coach in Bruce Arians now at the helm, Howard should be in a great to make a major fantasy impact in 2019. Lamar Jackson, QB, Baltimore Ravens: I love running quarterbacks. Love ’em. Jackson averaged 17 carries, 79.4 rushing yards, 0.6 rushing touchdowns and 18.59 fantasy points in his seven starts as a rookie. Projected over a full season, he would have finished with 272 rushing attempts, 1,270 rushing yards and 10 rushing touchdowns. That’s sick. And there’s no longer a threat to his job with Joe Flacco departing for the Broncos. Baker Mayfield, QB, Cleveland Browns: Mayfield started eight games as a rookie with Freddie Kitchens as the offensive coordinator. If you project the numbers he produced in those eight games over a full season, Mayfield would have finished with 4,509 passing yards, 38 touchdown passes and 304.3 fantasy points. With Kitchens now the new head man, Mayfield’s fantasy upside is, well, lovely. Damien Williams, RB, Kansas City Chiefs: Williams finished as a top-10 fantasy runner in each of his final three games and was a top-four back twice. Will the Chiefs stick with him in 2019 We’ll see. D.J. Moore, WR, Carolina Panthers: Moore showed some flashes of brilliance at the end of last season, and he averaged 17.2 PPR points during a five-game stretch from Weeks 11-14. His ceiling is sky high. Christian Kirk, WR, Arizona Cardinals: Kirk was clearly the top option in the passing game for Josh Rosen last season, and the addition of offensive-minded coach Kliff Kingsbury should be a positive. Dante Pettis, WR, San Francisco 49ers: Pettis proved to be a serious playmaker for fans down the stretch of his rookie season, scoring four touchdowns in his final five games of the fantasy season. Kyler Murray, QB, Oklahoma Sooners: I get it … Murray’s size is a concern for a lot of NFL folks, but the dude can run with the football and he’s more accurate coming out of college than Lamar Jackson.